Today we’ll discuss the Top 7 WordPress Commenting Systems that we’ve encountered. Quite honestly, all of these comment systems are good and any of them can work for you. But after this review, you may find that you’re drawn to one over the other. There’s no right or wrong, it’s all about preference. Engagement metrics like blog comments are seen as a seal of approval, and have now become something that many bloggers actively pursue. Though a metric proved to massage the ego, comments are more than just a token of vanity. They have now become an integral part of a site’s social identity. Fortunately, with WordPress and its native commenting system, adding a comment section is a snap! However, is the built-in system the right choice for you? To help you decide, we’ve compared it with six other WordPress commenting systems. From the start, WordPress has made a commenting system an integral part of its design, and for good reason: allowing comments is the best and easiest way for bloggers to connect with their readers. Visitor comments make for a unique and more intensive look at your subject matter, and can really help to enrich your blog posts. Sometimes people like reading the comments just as much (or more) than the actual post. And that OK because it all works together for the greater good of your article. Those comments are valuable social signals that can help to attract more traffic and engagement your way. And they can even help to get your point across. Accepting comments on WordPress doesn’t require a plugin at all. With its built-in commenting system, WordPress has taken the guesswork out of receiving comments. Though it is a plain Jane system, The native WordPress commenting system has what it takes to get the job done. A lot of bloggers use this system because it’s configured, pre-activated, and like the WordPress core itself, free of charge. Bottom line: it’s ready to use when you are. This is what a lot of bloggers (especially those new to the blogging world) are looking for. The built-in WordPress commenting system stands out for its user friendliness. Readers are only required to leave their name and email to comment. Less hassle for visitors to go through equals more comments for you. Keep in mind however, that the built-in system does come along with its own set of problems – particularly because it hasn’t seen a lot of upgrades over the years. One of the most notable issues with this system is that it lacks any social media integration. In addition, being a target for spammers continues to be one of its biggest drawbacks. From the makers of WordPress.com, Jetpack offers some of the broadest range of capabilities by far. Within this multi-faceted plugin, Jetpack has its very own commenting module. Jetpack Comments is an upgrade to the native commenting system rather than a stand alone unit. It’s able to mitigate the shortcomings of the system’s weak points, while keeping the good points. This has created a hefty user-base for Jetpack, thus putting it in-line with the best of WordPress commenting systems. Like the native commenting system, visitors aren’t required to login or signup, instead they can simply leave their name and email, keeping the commenting procedure short. And for those who prefer to login socially, Jetpack currently offers this feature with Facebook, Twitter and Google+. 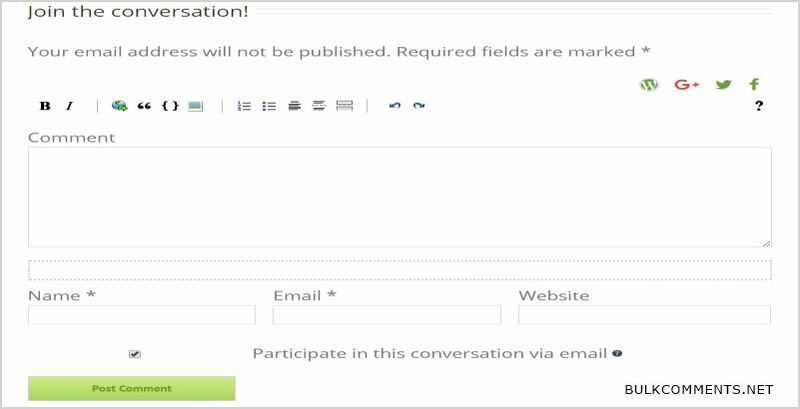 In order to promote continued discussion, the option to receive email notifications informing the commenter of further replies to the discussion is also available. Ease of installation is one of Jetpack’s many perks as well. Activating Jetpack is as simple as activating any other WordPress plugin. Once activated, just sync it to your WordPress.com account -and there you have it, you’re ready to start the module. With so much going on as far as features, Jetpack tends to be a bit resource consuming, and as such comes under fire at times due to this very reason. Some have complained that this large plugin weighs down their site. Yet and still, it’s a very popular plugin that many bloggers use happily day in and day out. So it’s best to test it out and decide for yourself. When it comes to commenting systems, Disqus ranks high globally in popularity. Part of its charm is due to its versatility. In addition to serving as a WordPress commenting platform, it also works in a multitude of other sites and blogging platforms using the Disqus API. With a wide variety of functions, this system offers superior performance to the native WordPress commenting system in some vital areas. If you’re big on appearance, then this system is one of the more attractive of those available. Some other features include: support for nested comments, social login and reply notification. And not only that… commenters can reply to other users’ comments by email, making it that much more likely that they will connect with other readers of your content and keep the conversation going. In addition to text comments, Disqus also supports rich media so that guests to your site can add pictures and videos to their comments. Furthermore, comments can be made directly through their Disqus account as well. This feature is actually more worthwhile than you may think, as disqus users can look at other users’ comment history (including those that were placed on other sites), by “following” them. This type of functionality is a quick way for visitors to find more sites with similar content. And they will appreciate that your site is a hub for this. People may discover your blog from other sites using the Disqus commenting system as well. Webmasters love the super flexibility this system provides – giving them the ability to moderate incoming comments with three choices of moderation: front-end, back-end or direct from inbox. Overall the system is pretty advanced, but at the same time user-friendly. However, there are still some things about the disqus commenting system that you may not like. For one, guests are prompted to login or signup before they can leave a comment. BUT… what many site owners fail to realize is that they can adjust the settings to allow for guest comments as well (no login/signup required). Because hey, even with all the easy on-line login options like Facebook, Twitter and Google+ and not to mention a Disqus account, many site visitors are often discouraged by this extra step and won’t bother to comment at all. Besides being inconvenient, many people feel that social logins are too invasive to their privacy, just one more reason not to comment. Facebook’s popularity has made it a household name. Even if you’re not someone who follows the Facebook trend, we all visit it sometimes. So it should come as no surprise that your readers are probably Facebook users too. Like the process used by your Facebook wall, Facebook Comments work the same way. This well-known style is easily recognized and will allow users to leave responses in a way that they’re used to. That’s plus number one for WordPress commenting with Facebook. Among other reasons to give this system a go is the one-click login via Facebook, reply notifications, and of course… where is one of the most popular places that readers share posts online? – Facebook of course. As well, spam reduction is a positive side effect being that a Facebook account is required to comment. On another note, some problems with this system include its technical process. You have to make an app on the Facebook Developers site before you can connect it to the built-in commenting system. And both joining it and creating the app can be difficult for some. Also be advised that the Facebook Comments plugin only simplifies the process of joining your app with your WordPress site; it doesn’t install Facebook comments on its own. Also, with few customization options, matching styles with your content may not be possible, making this one more setback for the system. This can mean that your comment section will look a bit awkward. Unfortunately, there hasn’t been a plugin made that can solve some of the problems that Facebook Comments comes along with. One case of this is the preference some viewers have for keeping their online anonymity. For some this is considered a lack of privacy. And great content and the ease of commenting just won’t be enough to change the minds of some people when it comes to this personal rule. With Facebook comments, the commenter’s name and profile picture are shown, and as you can imagine this will definitely turn some people off. This can, however, have a positive spin. By using incentives, CommentLuv encourages readers to leave comments. 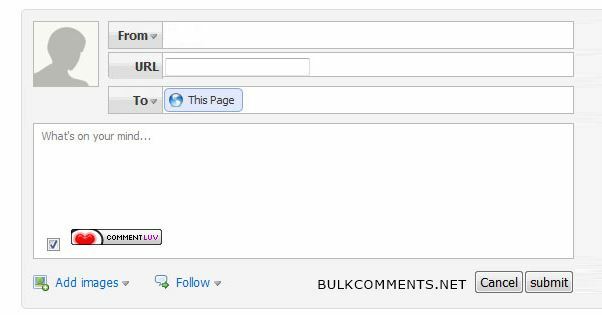 Readers who leave comments are rewarded with a backlink to their latest blog post when they fill in the optional website field. CommentLuv can be presented to your readers in several ways. Some of the ways to do this is to allow registered users to pick which of their blog posts they want linked – or offer to do-follow the links that are produced by their comments. Imagine what this will do for your comments section with a growing number of bloggers responding, when they also know that they can be rewarded a backlink in the process. This will motivate respondents to write attractive comments being that they know they’ll be getting a backlink, and surely they want other visitors to click on it right? Wouldn’t you know it though… that although backlinks are CommentLuv’s greatest attraction, it also becomes its biggest headache. Some of the comments are attractive alright…but in the wrong way. Truth is that using CommentLuv has a way of drawing a lot of responses that are simply advertisements for the person commenting. And the spam becomes obvious when you start to see comments that sort of relates, but nottt really, all because they want that backlink. This last offer in our WordPress commenting systems feature, Postmatic may be the most provocative of the set. Almost all commenting plugins work on the premise that the reader visits your site, views your content and then responds by leaving a comment. There is however another frequently used way to communicate which Postmatic has implemented: and that is none other than email communication. Making the most of this technology, Postmatic has opt-in plugin capabilities that are pop-up, slide-in and top-bar supported. In addition, even people who simply comment at the end of your posts will be signed up to your email list. And as soon as a guest is subscribed, they’ll automatically receive every new post that you write straight to their inbox. What’s more, your content is converted into HTML. So not only do they get the entire post that mirrors how it looks on your website, they also get to read it straight from their inbox. People wanting to comment don’t even need to visit your site to do so. Commenting has never been so easy. The guest can just reply straight from their inbox by writing their comment and pressing send. Then the comment that was emailed gets submitted straight to your website in real-time. Moreover, subscribers will also receive the comments that other users have made. And once again they can respond by simply replying to the email. Ease of delivery allows this system to expand the number of discussions your content inspires. Could using Postmatic have an adverse effect? Possibly. Since people won’t have to visit your blog to read your posts, this could cause a loss of traffic for your site. But keep in mind that with email, you can read content in even the most prohibitive of places such as work: where being seen reading a personal blog would be distasteful. When it gets right down to it, does where people read your content really matter? Is the fact that they’re reading and enjoying your content in the way that they want to consume it not enough? Livefyre’s trendy Social-Sync feature allows for maximum sociability. Want to sync your comments section with the conversations on your favorite social channels? This feature does just that. Another plus to this feature is the ability to tag friends and share comments to Twitter and Facebook directly. Both disqus and Livefyre are external commenting systems with a lot of the same qualities, and as such are in direct competition. And Livefyre, like Disqus has the same log-in requirements using social sign-in options along with using their own account system for commenting. But as was mentioned before, not everyone who comments wants to go through the trouble of logging in, leaving this system in the same predicament as disqus. But on the plus side, like disqus, Livefyre allows guest to look at other commenter’s comment histories and other sites they have left responses on. In this way it helps grow online communities. Then again, there are differences between the two. The Livefyre commenting system was bought by Adobe in May 2016 and comes with a lot of market leading attributes. Rated best in its class, this systems comment form has to be one of the most noteworthy of its features. This notable comment system comes complete with a diverse text editing feature which allows respondents to format the comments they leave along with potent media embedding and the text editing options – including the ability to use bold, italics, add checklists and links. In an instant, guests can embed their favorite pictures from Instagram or Flickr, or add videos from Vimeo and YouTube. Comment editing is another of this systems pluses and allows guests to rethink what they want to say. This system also allows the site administrator to edit comments if necessary. But that’s not all, blog owners find even more options to get excited about with Livefyre. Commenting systems are no different than anything else in life and comes with pluses and minuses. There is no such thing as the “perfect” commenting system. For those who don’t want to configure or primp their comments section, and have little time to deal with WordPress, then the native comments system will be suitable enough for you. As if you need a bit more than the basics, you might want to add a plugin like Jetpack to further the functions of the built-in system. And for those who are still not satisfied and want even more options, try an external commenting system such as Disqus. With external systems you get more power and they are beautifully designed, coming with a number of enabling options that allow guests to extract more from the comments that are left making for a real sense of camaraderie. And Facebook Comments is a logical choice if your site attracts a lot of social media types. And if you’re a webmaster who wants to give other webmasters an added incentive to comment on your blog, CommentLuv, with its backlink feature, makes this possible. Now it’s up to you to you to look over each system and separate the good from the bad in terms of what works for you, and from there, make up your mind. And if your current system is failing you, use that knowledge to work out what it is that’s going wrong and find a WordPress commenting system that can correct these flaws. So which commenting system do you use and why? Let us know in the comments below! Great breakdown of the different commenting systems. This really helped me a lot, thanks! I’ve been looking at Jetpack. I really like their comment form, but I don’t like that I have to install their entire plugin “pack” just to get it. Do you know if there’s any way around this yet? Unfortunately not. It’s all or nothing with Jetpack. Hello, what I’d like to know is are blog comments good for SEO? If so, how? 1. Blog comments will oftentimes contain keywords related to your content. 2. Blog comments lower your bounce rate. 3. Blog comments increase time on page / time on site metrics. 4. Blog comments send vital social signals to search engine that your site is active and engaging. 5. Blog comments add more content to your posts – which makes your content more in-depth. 6. Blog comments get indexed. “10 IMPACTFUL Benefits of Relevant Comments On Your Site”. I’ve never even heard of #7: Postmatic. The email response system sounds pretty good to me. Think I’ll have to check this one out. Wow I never knew there were so many comment form options for wordpress. And I’m sure there’s others more than this too. Thanks for sharing this information, very useful. Great article, thanks for this! I have been going back & forth wondering which commenting plugin I will use for my new WordPress site. My niche would be largely geared toward Facebook users, so I might go with the Facebook commenting form. But who knows, the others sound great too! Hi Elaine, glad this article is helping you. All the best with your new site!